The small water feature by the main koi pond was added to create some sound as well as add an extra dimension to the area. This is next to the new decking and as well as the ducks that often feature (see post from 28 May) it is also home to a number of white and red goldfish - even the fish have been colour co-ordinated to be mostly white in here to match the white colour scheme of the new area. This pond has been connected to a canister style filtration system which is pump fed via an external pump housed in the main koi filter house. 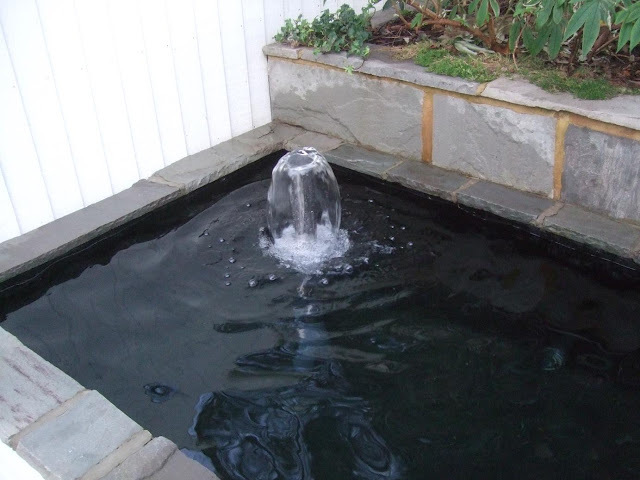 The filtration is excessive for the size of the pond - with the canister being capable of filtering a pool up to 5 or 6 times the volume of this small goldfish pool. However you can never have too much filtration on a pond and so it is always better to over, rather than under, filter a pool. Manufacturers often exaggerate the capabilities of a filter so always go for one capable of filtering a much greater volume of water than you have. In the old koi pond we had a number of goldfish kept with them. Those had grown to quite a size, and have remained in their old home, with only the koi moving to the new pond. Those goldfish were more than capable of eating the larger koi pellets we fed the fish. But as we stocked this small pool with new fish they are a little bit too small to eat the same food. We spent quite a while looking into which food to use. Some fish foods have a lot of "filler" in them - often a type of ash - which clearly the fish can not digest so you get a higher amount of waste. More fish waste means more pressure on the filter and more maintenance from the fish keepers - both in cleaning any waste in the pond not removed by the filter and also by cleaning the filter itself. In the end we opted for Tetra Pond Goldfish Mix, which is a good quality food, but also of a suitable size the small fish could eat. At first they seemed to ignore it, presumably the small pellets were different to the food previously fed to them at the aquatics centre - possibly a flake based food rather than a pellet, however they now recognise it, and indeed recognise us. When we pass by they now come begging for food, although the ignore people unfamiliar with them! All in all we are quite pleased with the small water feature it has worked out well. To see more on the construction see this detailed post on the main Alternative Eden site.